Subscribe to comments with RSS or TrackBack to 'Such surprise non-tenders (Non-Tender deadline 2014)'. Descalso might be a 2B option as well, although none of these guys jump out at me. In fact, I don’t know that any would be better than Danny, certainly not when you consider his defense. That’s not to say that Espinoza is the answer, though. I’d still like to see the Nats take a flier on DeShields in Rule 5. As for the hurlers, as I wrote last night, what team is better positioned to give Medlen and Beachy the time they need to fully recover? Sure, they would be gambles, but you could probably sign both for three years apiece for less than J-Zimm is going to want per season. And you’d probably have some idea by the end of 2015 whether they are going to be viable options going forward. I’d particularly go after Medlen. I have always really liked Medlen, and he looks close to returning. But $6m isn’t throwaway money, and I’d be surprised if we get him barring a significant roster shake up. Where does he pitch for us? Wouldn’t SEA or San Fran look like better options for him to take a 1 year pillow deal to reestablish himself in a pitchers park with a clearer path to a rotation spot? Beachy and Ogando look much more interesting to me because the cost is close to throwaway money. My only hesitation is that ATL and TEX are good, smart organizations, so if they are walking away from that, what gives? Ken; agree totally, in fact I agreed so much that I threw together a quick post I’ll bet if you offered Medlen something like a 1yr $2M plus another $4M in incentives based on starts he’d take it. That’d allow you to move a starter as we all think may happen and have open competition for the 5th spot AND have coverage in Medlen later on. s agents, this is exactly what i’d be looking at. West coast team (where most of the pitcher parks are) with SP issues. I’d be really interested in Ogando here. I like him as a BP option. I’ll bet lunch that Medlen gets a higher guarantee than $2m. I think teams are pretty relaxed about TJ, even double TJ. Beachy is a different story, since it isn’t clear that he ever got over the first one. He is almost the TJ exception. Well, Washington is the team that gave Chien-Ming Wang $7M over 3 years to rehab his shoulder. So maybe they’d be more generous than $2m. I just looked it up, and Medlen grew up about 10 miles from the Angels’ stadium (and about 20 from Chavez Ravine). So yeah, there’s very likely going to be local interest. I imagine his old teammate Tim Hudson will put in a good word for the team by the Bay as well. I wouldn’t rule out the Braves, either, who were said to be making a push to work out something with him yesterday. So what chance do the Nats have? Well, if Medlen is smart, he realizes that this is it. If the elbow snaps one more time, it’s over. What team is undisputed in being patient with TJ guys and having proven routines for them? You got it – that team his Braves openly mocked a couple of years ago for its conservative approach. What team has plenty of pitching now so it won’t be looking to rush Medlen? Same folks. (Certainly not the Angels, who are desperate for arms.) We’ll see. I hope Rizzo is at least making a call. There’s nothing stopping the clubs from re-signing the same guys they just non-tendered; they’re FAs and the FA season is wide-open. But if the Braves did this just to lower his guaranteed pay, he’s putting a lot of faith into the management there. I still can’t get over the Justin Smoak non-tender. He had a club option for 2015 that Toronto immediately bought him out of (for $150k) right after acquiring him on waivers (which cost them $20k to do). Then 5 weeks later they non-tender him. So why the hell did they just spend $170k? There’s something else to that story. They resigned him for $1m after the non tender. I didn’t do the math, but I think they saved about $1m doing it this way, although they risked losing him this way. The story I saw said Smoak might have made $3M in arb, so it claimed a $2M saving for the Jays. Smoak’s agent claims that other teams offered him more, but that he took the Toronto deal for a chance to play every day. I don’t know if the Braves tried a similar nontender/re-sign deal with Medlen and/or Beachy, but if they did, the silence of the last couple of days seems to indicate that it has backfired on them. I have been thinking about a trade. It probably doesn’t work, but here goes: Brian Goodwin and Taylor Hill for Brad Miller. Kind of a trade challenge, since both Goodwin and Miller are tarnished high prospects. I think Miller has more value, because he can show some success at the major league level, so we add a back end guy that could help now to balance it out. Fits needs for both sides: SEA loses Jackson this year, and generally is not thought to have much in the way of OF help coming in the next few years. Miller obviously is someone to fill 2B this year, and maybe hedge Desi leaving next year. Flaws: (1) SEA is going for it now, and Goodwin isn’t ready for that. But Hill may give them even more depth and let them trade Walker for a now piece like Upton. (2) I don’t know how far Goodwin’s stock has fallen. But he was a top 100 prospect for 2, maybe 3 straight years, so I can’t believe its gone. But our need for him is less due to Taylor and Souza. Which I thought was an awful, horrible deal for the Nats. But a fantastic one for both Boston and Seattle. I dunno; I don’t think Miller is worth that much. Is he the guy who hit .265 as a rookie or the guy who hit .221 last year? Miller’s minor league numbers were unbelievable … but a ton of those minor league at bats were also in the incredibly hitter friendly California and Pacific Coast leagues. So back to Wally’s proposal; i’d think we would have to sweeten the deal to get Miller. More than Goodwin and Hill. I’d think it’d more likely need to be something like Souza and Treinen. Souza gives Seattle a RH power hitting OF that they need (I don’t think they got 10 homers out of RF all year) and Treinen could compete for the rotation or settle into their bullpen. Now that being said, i’d dump Goodwin and Hill in a *heartbeat* fro Miller. Which is why I don’t think its enough. I think you’re right that it isn’t enough, kind of for the same reasoning as you: I would do it so it probably isn’t enough. But I wouldn’t even trade Souza straight up for Miller, and I am still trying to figure out what I think of Treinen. I am just not sure how good Miller is, so don’t think I could convince myself to give up something I felt confident was good. I think Souza’s base running and fielding give him a floor of 1-2 WAR, and if he slugs > .425, that’s a 2-3 WAR player. Hugely valuable at pre-arb prices. I saw that trade proposal too, and also thought it sucked for Nats. NFW. I think I even commented on the article. I like Cameron but that was ridiculous. Miller has been a 1.5-1.8 WAR player his first two seasons, and is projected as a 2.3 fWAR player next season. Despite already having two seasons under his belt he’s still got room to grow (turned 25 on 18 Oct) so he still has some upside. He’s not arb eligible until after the 2016 season. So he has some value. That said, like Wally I wouldn’t trade Souza for him straight up. Ditto on the Cameron article, which is why I didn’t even mention it. The Nats give up two all-stars for a marginal SS and a wounded wing who hasn’t even made the majors? Rizzo probably got a good chuckle out of that one. I like Wally’s proposed trade, though, as Miller is certainly worth a look. Anyone who can play 2B now and prospectively SS later is. However, I’m not sure there would be much interest in Goodwin right now. I honestly don’t know how other teams value Hill, but I see him as sort of similar to Karns in the Nats’ trade arsenal. The “bad” version of Miller doesn’t look any better than Espinoza, though. That’s my benchmark for infielders right now – would X be an improvement on Danny? As for Souza, if the Nats trade him, I think they’ll regret it. I read the MLE article on Fangraphs on Thanksgiving weekend and started playing around with the numbers with Souza. Using pretty well-established rates of conversion for AAA players, Souza’s 2014, plotted over 650 ABs, converted to a close comp to Carlos Gomez, with more walks. He came out in the same ballpark as Donaldson and Rendon, but with a lot more SBs. Even knocking 10% off the conversion rates, you still get comps like Longoria. I am NOT saying that Souza is guaranteed to turn into that level of player. But fairly established metrics – and ones that other teams likely are using – give him a chance to be elite. I’m seeing articles saying that Greinke might be available. Just thinking outside the box, would you do Strasburg for Greinke? The Dodgers would unload a boatload of contract obligation bucks, while the Nats would get four years of a *signed* star hurler. I don’t know. The Nats would probably be looking at paying about the same amount per season to re-up Zimmermann, but for six or seven years. And yes, the Dodgers would probably want more than just Stras, but no more OFs, so probably a pitching prospect or two. Greinke has an opt-out after 2015. Otherwise, I’d do it in a second. How about Taylor for Miller straight up? Taylor has a long way to go to reduce those K numbers before coming up in 2016. He could be great, but he could be Danny Espinosa. If it’s any consolation on Souza, by all accounts his was the name teams were asking about at the deadline last summer, and Rizzo wouldn’t budge. In a Fangraphs chat the other day a fan of another team proposed a (typically lousy) trade to get Souza away from the Nats. Not only did the FG guy shoot it down, he offered that the Nats see him as an important piece – especially for 2016. I do find the Greinke opt-out on his Fangraphs card, as well as info that he gets $3M if traded. Neither of those rather important details was mentioned in the two articles I saw on his availability. That’s interesting. So Greinke will be on the market with Zimmermann at the same time Zimmermann is seeking a Greinke-like contract. I agree with the concerns on the Taylor K’s. His already-high K rate increased significantly last season, along with his HRs, while his doubles dropped almost in half, leaving one to fear that he’s taking more all-or-nothing swings (a la Danny and Desi) instead of just trying to drive the ball. So yes, I would be much more open to trading Taylor than Souza, even though Taylor is two years younger and better defensively (which should make him more marketable). I think Souza is your “starting OF in case of injury” in 2015, even over McLouth. And may see time; all three of our starting OFs seem to go through their injury periods. And he’ll make his case for being a starter in 2016 in some fashion or another. Whether its (lf-cf-rf) Souza-Harper-Werth or Werth-Souza-Harper (probably the best defensive lineup) or Werth-Harper-Souza or even Souza-Harper-Werth (probably the least effective defensive lineup) …. that’s some serious pop in the OF. Agree in not flipping him for Miller, despite Miller’s projected war. I’d rather keep Souza and roll dice with Espinosa. Never been that impressed by Greinke. In him I see a good pitcher who has one fantastic season (2009) and then three years of league averageishness before landing in a massive pitcher’s park and a $250M offense in Los Angeles, enabling him to put up sub 2.75ERA and double digit win seasons. You put Greinke in the AL east and he’s Jake Peavy. FAIRFAX, Va. — Washington Nationals outfielder Jayson Werth has been convicted of reckless driving and sentenced to 10 days in jail for driving over 100 miles an hour on the Capital Beltway. A Fairfax County judge sentenced Werth Friday following a short trial. It is not unusual in Virginia for defendants to receive short jail sentences on reckless driving convictions where the speeds exceed 100 miles an hour. The 35-year-old Werth will have the option of appealing his conviction to Fairfax County Circuit Court. A state trooper testified that on July 6, he followed Werth for about half a mile at 105 miles an hour before pulling him over. The speed limit was 55 mph. Werth batted .292 last season with 16 home runs and 82 RBIs in 147 games. Hilarious and Ridiculous. 10 days in jail for driving fast. Good thing we have our jurisprudence priorities straight here on the mean streets of Fairfax County. Todd, as I said I’m certainly against trading Souza for Miller straight up. But I’m not enthused about “rolling the dice with Espinosa” either. Blech. And I know that’s not your “Plan A” either. Hopefully Rizzo is able to pick up a solid starter without giving up one of the top prospects, or at least is able to pick up a good platoon partner for Espinosa. Well, the middle infield market doesn’t look too great if the Yanks had to settle for Gregorius as the new Jeter. Geez. Compared to him, Espinoza is an all-star. I thought the Yanks might make a bid for Desmond. I would have been asking for Refsnyder as the starting point of the discussion. Our guy Robbie Ray is now in pinstripes, though. I wonder if the Tigers rushed him trying to prove that they didn’t get fleeced in the Fister deal. Oops, I read it wrong. The D-backs got Ray, who may end up being the best player in this deal. He and Walters are going to team up to stick it to Rizzo! But seriously, good luck to both. They have potential. 1) The Nats are in a fantastic position to make major upgrades to their team and system and depth. If they sign their top talent, great. If they are finding it too difficult, the winter will afford them the chance to see who will overpay for their marquee players. And demand creates overpay. This will be an offseason like no other. 2) Rizzo sells high. That’s how he trades, be it major leaguers or prospects. He will never be in a position to sell higher on either Zimmerman, Clippard, Span or Fister. 3) Rizzo, more recently, also has consistently traded to upgrade the team, not merely to replace depth. And so this bears the question — how do you upgrade a team when you trade a star player? By trading for a controllable star player with a longer contract in place. I can genuinely see Rizzo using his pieces to pry away an under contract player like Tulowitski or Starlin Castro, or a high grade if signed starting pitcher (assuming they part with Zimmerman and Fister). 4) I am also thinking about other teams’ “untouchable” prospects. There are enough teams who are significantly remaking their rosters. And so, in this climate, the Nats talent — which is highly valued around the league — can bring some kind of haul. I have my eye on the heavy power infield bats from the teams that want elite starting pitching (and you know who they are). 5) There is plenty of talent in the Nats staff and even at the AAA level to sweeten a trade package. People like Tyler Moore and Detwiler have obvious value to certain teams and can really enhance a package in which they are not the principals. 6) I am not so sure the Nats should not/would not pursue both Fernandez (ML ready option) and Mocade (minor league depth) as Cuban infield options. Again, they are free agents, costing only money, and Moncada is the equivalent of a #1 overall draft pick. Without the bonus pool madness that has already tied their hands. 7) If other GMs believe in the Scherzer conspiracy, maybe it has legs. It would certainly give the team enormous security and flexibility to move salary for elite stocks of talent and roster/system upgrades. 8) Teams to watch are SD and other teams with rookie GM (OK, maybe not Arizona), the pitching hungry teams like Col and TX and Chi, and the teams with which the Nats have good insider exposure to their prospects and systems (TB, Cin). And then there’s the A’s, though Donaldson is traded. –The Nats may end up regretting that they protected Goodwin over Hood. At the same time, the system “worked” to give a blocked guy a chance with another organization. Good luck to him. –I agree with forensicane that Moncada is the Cuban who has interested me the most all along, all the more so considering the Nats’ lack of middle infield system depth. –Ah yes, the Scherzer “conspiracy.” All in all, I think Zimmermann is a little better between the two. But I do understand the whole thing of signing Scherzer and then being able to use Zimmermann as a trade chip to get someone like Starlin Castro from the Cubs. Here’s what I would do, particularly knowing that Boras is Scherzer’s agent and will want an opt-out clause anyway. I’d put this contract on the table for both Scherzer and Zimmermann: 30-28-26-18-18-18. There is a player opt-out after three years, and I would also try to get a team $25M buyout option after three as well in case the guy completely falls apart. But basically, it would be a 3/84 contract, overpaying slightly in exchange for a shorter-term obligation, so this contract is likely off the books before the Nats have to deal with Harper and Rendon. For Zimmermann, there would be another year on the front to cover his final arb year this season. I’d also think about telling Boras that the same terms are available for Strasburg, although I’m sure he’d still want to take him to FA. I should have added that the contract would be a whoever-takes-it first deal between Scherzer and Zimmermann, although if both bit on it, then I guess you’d have quite a trade chip in Strasburg. I have gotten excited over Moncada’s profile too, given how obvious he fits the Nats’ needs (and more than a little curious about his story), but I am skeptical the Nats pony up the $80m or so to get him ($40m signing bonus, then the same amount as a penalty for going over the international spending cap). This doesn’t even include his salaries through his years of control, which could be $50m if he reaches his potential. I just don’t see them taking that kind of financial gamble, but maybe I am wrong. I’ll be interested to see what happens at the winter meetings. Beyond just the Nats, seems like there are a lot of things going on this year. Should be fun. The Nats have a glut of starting pitching coming into AA. The sell-high of the group is John Simms, although Austin Voth is often mentioned in discussions and may be the difference maker in a trade. Likewise with Matt Skole. he may not be a player one could keep on a 25 man roster all year, but a player who slots in nicely to a system that is giving up power in a trade. The Nats also have a glut of catching in the lower minors. Kieboom showcased very well at Mesa and he is blocked from above by Severino and from below by Ready/Tillero/Reetz. As for Moncada, the facts that he is 19 and “not ML ready” does not mean that teams are bidding up for a GCL talent. If he is ready for AA now, that makes him no ordinary minor leaguer. What would Bryce have been worth at age 18 as a Cuban? Ah, I forgot. Rey Lopez may be another sell-high type. Hype leverages well. OK, we need an ID check here. Can this be the real forensicane advocating using some of his beloved minor leaguers as trade chips? Actually, I agree on most of the suggested sacrificial lambs. I’ve always thought Voth in particular would be targeted by other teams. I have no idea whether to believe the hype on Lopez, but it should would be fun to see him and Giolito at Potomac in 2015. I don’t know how much trade value Skole would have right now. Ditto for Goodwin, two guys not long removed from being stars of the system. With the catchers, I’d hate to lose Kieboom. I’m still not sure whether I’m believing the hype on Severino, although he hit better in 2014. I was thinking that Moncada was supposed to cost significantly less than the others, but it sounds like Wally has read more about him than I have. If that’s the price range, I’m out, and sure Rizzo is as well. re; minor leaguers. I definitely believe in trading when value is maxed (eg Brad Peacock) and with true value coming back. But sometimes a player is a trade chip that has value because there is a risk of losing him for nothing in Rule 5 (Skole). I agree that it makes no sense to trade Goodwin now, and no one will want him anyway coming off a torn labrum. Skole might intrigue someone as an extra part to a deal. I’m not advocating trading Kieboom. I am saying that he showcased very well in Arizona and that may peak his value, especially with some many catchers in the system coming up and Severino in front of him. These are suggestions I am throwing around because I truly think that if the nats are going to trade, they should trade to upgrade — which means trade for a superstar (Tulowitzki) or a superstar in the making (one of the rangers IF like Profar or Cubs Baez). The Nats have the depth to do it. People value their talent and there are a lot of high value chips. It’s about what the team would trade for, and I say, IF there will be trading, it should be for superstars under contract or under control for their youth. Brock Holt would be a nice fit for us, as a lower level guy. LH 2b/ utility guy. shouldnt cost a bundle, but the Bosox are hard to figure sometimes. the hard part for Rizzo is that most of his trade chips have a lot of competition (JZ, Fister, Clip). His main trade chip against the grain is Desi, but I see almost no scenario where he trades Desi. It will be fun to watch. I was very happy to hear that the are trying to resign JZ again. Maybe when Lester signs, everyone’s view of market will come into focus. If Lester gets 7 years, I think JZ’s market is too high and he gets traded. Btw, I think it is a negative on Rizzo that he let it get to be some many key guys on the last year at one time. I am a Rizzo fan and he has many more pluses than minuses, but this is a minus. On the “so many guys getting to the last year at one time” as a minus – for me if it is it’s a venal sin and not a mortal one. Trading away players approaching free agency makes sense for non-contending teams. For a contending team there is a lot more to be said for getting what may well be the players’ best years at a discount, pocketing the draft pick and moving on. Especially when it comes to pitchers, whose long term big money deals very rarely work out. I can see that point of view, but for me, I’d rather see a consistent playoff contender over a longer series of years, as opposed to an up and down approach. This team, as currently situated, will either take a big step back in 2016 if they lose all of the guys approaching FA, or they’ll will pay retail prices to replace some amount of them in the FA market. Trying to break in 6 significant players onto a team competing for the playoffs is hard, particularly if they are rookies or young guys. I think it is better to feed in just a few each year, which is why I think it is a mistake to see so many at once. I think a team should also be assessing themselves relative to their competition. Winning your division by 25 games gives you no better chance at playoff success than winning it by 5 games. For instance, if you took Fister off this team right now, I don’t think their odds of making the playoffs change appreciably. Sure, we’d feel a little less secure, but I don’t think it would be a huge deal. Same is true for some combination of the rest of the players. So if you believe that you’ll have almost as good a chance to get in the playoffs anyway, and could add a few pieces to help improve the odds in 2016/17/18, I’d make that trade. Btw, this is why I like baseball. There are a lot of ways to think about value, the game and building a team. Seems much more so than the other sports. I’m with Wally on this one. After watching the misery of a quick exit from the playoffs, I’d rather build a long-term contender than hope to catch playoff fire for one year before a rebuild. The Nats have some really good things going for them in 2015 – 1) NL east is looking weak 2) We have good depth in the OF and pitching. While Span, Clip, and J-Zimm are arguably all better than their replacements, Souza, Treinan, and Cole/Jordan could probably still get them to the playoffs while potentially becoming new core players. Meanwhile, we desperately need a second baseman, so those 3 vets could fetch a long-term solution there, while saving payroll to sign Desmond, Fister, and others. The problem with the “winning your Division by 25 games is no better than winning it by 5” line of thinking is that going in no one really knows how many games it’s going to take to win the Division. Sure, the Nationals could have won the NL East by winning 80 games last season, so the won 16 games “too many.” NOW we know that. This time last year, with the Braves coming off a 94 win campaign, not so much. Not knowing who on the Nats is going to struggle/get injured this season and what other teams are going to exceed expectations, it’s a fool’s errand (or a fan’s errand) to blithely make a team worse on the assumption that things will go well. I also think that the assumption that the Nats are doomed to collapse after 2015/2016 if they lose most of their pending free agents is overblown. Three years in baseball is a LONG time to project ahead with any degree of confidence. In three years the team will still have Harper and Rendon in their primes, and that is one helluva start. Beyond that, we’ll see. How much worse would the team be at least with Span and Clip replaced by Souza and Treinan? I’d argue it’s pretty comparable. J-Zimm is not replaceable by another pitcher, but he can fetch a good 2B and close a different hole, while the Nats use a guy like Cole/Jordan to be the #5. If they stand pat now, the Nats may have holes in 2016 at 2B and SS, and be trying to replace 2 starters and some relievers. What happens then if Werth is weaker by then and/or one of the other core guys gets hurt. They will be mixing in too many rookies IMO. Of course no one knows how each player will perform each season. No one would argue against that. I suspect that is why it is fun for most of us to watch. Yet despite that, each year a team makes decisions based on what they think is going to happen, and have developed rules of thumb to work by. A healthy player, in his prime, who has produced at the major league level, will have the highest likelihood of repeating that performance. As you start changing each of those qualifiers, you move the percentages. Right now, we ‘project’ to be much better than anyone else in our division. It guarantees nothing, but it gives us an expectation and I think since it is based primarily on seasoned major leaguers in their prime, it feels reliable. Best that I can tell, take away one or two of the walk-year guys, and we still project comfortably ahead of the other teams in our division. The error bar certainly gets narrower. I think if we lose all of the walk year guys and replace them from internal sources, there would be a decent chance that we would ‘project’ to be 3rd, maybe 4th going in to the 2016 season. You want to take the best shot at winning the WS right now and figure the rest out when it happens. OK, maybe that is the right way to go, but it certainly isn’t a slam dunk. I have said before what I would do, which is extend two of JZ/Stras/Fister and flip one or two of the others now to get some pieces under longer control. I think that we’d still have a pretty good shot this year and through the end of Rendon/Harper control years. Oh, it’s not a slam dunk either way; I totally agree with that. On another site I saw someone compare being a major league GM to playing four-dimensional chess, and it’s really true. I’m glad that Rizzo and his people are making the decisions and not me! I kind of have a foot in both camps on this – don’t dilute too much and miss our big win-now chance, but do some to set up for 2016. There will be some moves. I’ll be surprised if Clippard isn’t traded. The team won’t re-sign him at more than $10M per, and the Nats probably aren’t enthusiastic about paying him more than $9M this year. The problem, of course, is getting a reasonable return for a closer-quality reliever. In fact, the return is the problem with all of the final-year guys. Most teams like to deal prospects in return, but the Nats need pieces for NOW. You don’t hear much mention of Span being on the market, but I’m not sure why not. He was well above most of his career marks last year and unlikely to repeat them. The Nats have another OF ready in Souza. Harper can play CF, not like Span, but well enough. I’m more leery about trading J-Zim or Fister. They’re the heart of the rotation. I’m conflicted about extensions for either of them, but the team would be most devalued by trading them, unless the Nats did something like sign Scherzer and Medlen, as discussed above. There’s no way the Nats would trade both, I don’t think. My guess is that if one were to go, it would be J-Zim, because he would have more value, and because he would be less likely to re-sign. I’m not sure what to think about Desi. I’m not big on extending him, and I think his decline has already begun, but a near replacement will be hard to find. Let the 4-D chess begin! It’s darn cold by the hot stove, so we need something to discuss. Well, here are a couple of twigs for the Stove: the Onion signed down in Miami with his brother (as I think someone predicted), and Brandon Laird signed with a Japanese club. That second one is too bad, I would have liked him in AAA as injury insurance, but he probably makes more money this way. Maybe he can parlay a good season into a chance at the big show back here. a) It’s a buyers market right now. That means that for teams with big budgets and big holes, and even big holes and lesser budgets, they can chose to splurge on the FA, buy prudently for the less luminous free agents, or trade for 1-2 year rentals that are actually underpriced. I think we are all kicking ourselves that the Nats did not try to outbid the Jays for Donaldson. What this means is that if the Nats decide they cannot or will not sign particular players, they need to just wait until the available talent pool dries up. Most GMs will not meet their needs when that happens, or there will be GMs who have created new organizational needs while dealing their assets before arbitration. Clearly, the Nats are sellers. But if they are sellers, unless teams are in love with a player, they will not bid crazy to get them while there are so many serviceable free agent arms available. The Nats truly have so many sellable assets, some by necessity, that waiting patiently absolutely helps maximize the potential for useful return. 2) We may not value the Nats assets, but other teams do. But no matter how valued, the value in THIS market for one year rentals has plummeted. It will not correct until the available pool of players shrinks. So we may see a deal today, we may see it tomorrow, or not at all. If not at all, then Rizzo is playing smart to let the rotating chairs stop and for GMs to reckon with their deficiencies and to panic into paying Rizzo’s price (see Mike Morse and deadline deal trading of key players). 3) When Rizzo speaks of Rendon’s positional flexibility, he also speaks of his capacity for playing shortstop. He performed ably there in spring training and, while the notion is not the first option, if the Nats acquire a young player whose defense proves to be better suited to 2B and Desi goes, why trade for a market that produced Didi Gregorius and overpriced Profar-Odor types when you have Rendon already in house? The Nats’ lack of catching depth really hasn’t been discussed at all. Ramos is terribly injury-prone. Lobaton is a competent backup but not a great long-term fill-in. Solano is gone, and they will have to DFA Leon sooner or later since he has no options and won’t be on the 25-man. Severino is ticketed for AA and I guess would get the call in an emergency. The problem with doing something about this situation is that catching is so bad in general across the league that guys whose quality should have them at AAA are getting MLB deals. The Nats could do something like try to get someone like Vogt or Jaso from the A’s for a LH bat for the bench, but both have had injuries that make them suspect as catchers, particularly Jaso. I don’t have the answer; just raising the question. c) The Nats will trade their hyped prospects only if they believe they are selling high. And they will maximize return. d) Keep an eye in the trades for the unheralded prospects that Nats bring back. These are the Blake Treinens in the Morse trade types. That is where value emerges from scouting and the Nats great strength. Again, I think we should keep an eye on the Rockies, Reds, and Rays organizations as talent pools that Nats brass now know very well. And of course, the A’s. Watch how these teams are meeting their needs in the coming days — or, not. There are many competent AAAA catcher types still on the market. I think if the team released Leon after the Rule 5, when teams bring their rosters back up, there would possibly be the chance to get him through waivers. And even if not, there will be replacements out there. Lobaton finished well and is valued. He will be the guy in 2015 and then we can see where the system is at this time next year. It wasn’t so long ago that we did not believe Rendon could get through a full season. Ramos will get there. And if he does not, the team will know next year just how good its deep catching pipeline is. I think Span is definitely tradeable – for the right deal. He will not get a QO and the team will not resign him because Taylor and Souza are the future. His value is at its peak and he would deservedly get something back. But I see any deal of Span as a multiplayer exchange, say involving assets like Taylor Hill and/or Detwiler or even Espinosa. I do not for one minute believe that the Nats were not involved in the bidding for Donaldson. That flies in the face not only of both team’s interests (A’s to maximize the price, Nats to obtain a valuable player that meets a need) but also of Rizzo and Beane’s extensive history of making deals together. What I do believe is that Beane got a piece in that trade that he really, really wanted from the Blue Jays in return in Brett Lawrie – and the Nats have no real equivalent piece they could offer. Because the Nats do not have what Beane wanted, they would essentially have had to overpay (think Rendon or Giolito). There is also a bit of risk with Donaldson that may have kept Rizzo from overpaying. Namely, that although his range and hands are fantastic, Donaldson has a throwing problem. That’s why he led the league in errors. He only made six fielding errors, but made an astonishing 17 throwing errors (http://www.fangraphs.com/blogs/the-thing-about-josh-donaldsons-defense/). And as pointed out in the article, it’s not a new problem for him either. The Nats already have one third baseman whose throwing problems have led to him being moved to first base. Do they want to overpay for another one? John C, very interesting stuff. Thank you. Everything that makes its way into the papers gets there for a purpose, imo. So when I read something like ‘two GMs said, had they known Donaldson was available, they would have easily beaten TOR’s package’, I don’t take it at face value. I assume it was planted either for a petty reason like ‘take a shot at the moneyball guy’, or maybe to create an atmosphere that takes heat off a GM for not getting a guy that his ownership or fan base valued. Or more likely, for some reason that I can’t guess right now. But all of these guys, including Beane, are not only very good at their job, they have deep staffs that know how to negotiate a trade, and when they make a deal, they make the one that they feel is the best out there, after doing diligence. That being said, I haven’t been wowed by Beane’s return lately. For those of you who have ever played fantasy football or baseball, he strikes me as that owner who gets the reputation of being too smart to trade with, so he actually has to overpay to get someone to make a trade with him. Btw, the way this Lester thing is playing out has me pessimistic about resigning JZ. If Lester gets $150+m or 7 years, JZ is going to want more than Rizzo/Lerners will give. Although it will make me laugh if Cherington is the one that goes 7/$175m to sign him, which will be a colossal mishandling of the situation by them. Here was a Nats blurb from a Fangraphs chat (not my question). Sounds like a pitcher might be going? The Nats have been awfully quiet… What do you see being their ‘first domino’? Another note says that the Dodgers might be looking to move Dee Gordon. Hmm, a 2B who has experience at SS who could fill the soon-to-be-vacated lead-off spot. Sounds like someone who might interest the Nats very much. Also, call me crazy, but I’d have some interest in Kemp if the Dodgers are willing to pitch in as much toward his contract as they’re said to be telling the Padres that they would. I agree that the spiraling Lester bidding could hurt the J-Zimm signing potential. It might help raise his trade value, though. If nothing else, it probably will assure that’s he going to play it out and go on the market. I don’t see any way that we sign J-Zimm. Way too much smoke. So… I agree that the rising price of Lester provides for a better delta on J-Zimm’s 2014 salary ($16.5MM) vs value ($23MM?). What is that $6.5MM worth? I’d argue a pretty good prospect. As for Scherzer, it’s not happening. Rizzo is helping Boras to create value by spreading some gossip. If Rizzo isn’t going to pay full value for J-Zimm, he’s not going to do it for a guy 2 years older either. Zimmermann is better than Lester in nearly every category. Not by significant margins, but better. So the bar for Zimmermann just went above $25M per. The higher it goes, the harder it becomes for the Nats to justify. On the trade front, the Red Sox just got more desperate. The Dodgers’ GM is now saying Gordon is NOT available. John C: great points on Donaldson. Though I will say this: Donaldson may have a bit of a scatter arm, but he was the clear AL 3b leader in both UZR and DRS. So it isn’t as if he’s “bad” defensively; he’s getting to a lot of balls that others wouldn’t get to and periodically throwing some of them away. that beign said, while Beane doesn’t really care that much about defense (and has the DH to “hide” sub-par defenders to boot), Rizzo *does* care and maybe that was the singular reason the Nats-As didn’t match up on a Donaldson trade. The rising price on Lester is pretty hard to believe. Wasn’t it just two years ago that he posted a 4.82 ERA? Is everyone just assuming that the 2012 season was the “chicken and beer” season and everyone was purposely tanking? Also pretty ironic that Lester puts up, easily, his best season in his contract year? In nine seasons he’s gotten two 4th place Cy Young finishes … is he really worth the money we’re hearing? The Lester mania is a continuing trend: with more and more of the game’s best pitchers being locked up to extensions prior to hitting FA … it means that the ones that *do* hit FA are getting more and more overpaid. And to me, if Zimmermann and Fister’s representation are at all intelligent at their jobs, they both realize that getting those guys to FA will probably earn them 15-20% more than they’d get in an extension. Clearly Boras knows this; hence why its folly to talk about an extension for any of his guys (Strasburg, Rendon, Harper). Nats best shot is to try to extend Fister, who has lesser peripherals but has a track record over the past few years that’s inarguable. It isn’t the Nats fault he’s underrated; take advantage and get a rotation mainstay for the next 5 years. Fister doesn’t have to be the ace; he can continue to slot in with Gio, with Stras for a bit, and then eventually along side Giolito and Cole. The other shoe in this equation is that the Lester price should further ratchet up the Scherzer price (unless Boras waits too long with him), which would continue to increase the Zimmermann price. That said, I would think that the optimal trade window for Zimmermann would be before Scherzer signs and takes another high-spending team out of the market. The Cubs just dropped out of that pool, and of course they were the logical Midwestern destination for Zimmermann. I too have become convinced that Zimmermann’s price has gotten too high for the Nats. I’m conflicted on whether he is worth more to them as a 2015 stud or as a trade chip, though. 6/$155M for Lester. That’s AAV of 25.8M. Damn. Now, he’s more valuable b/c he’s a lefty and b/c he’s basically injury free. But that’s $25M/year for ages 31-36 seasons. Man. Coincidentally the Red Sox offer to him last season? 4yrs/$70M. Did this factor into his dealings with Boston, the insult offer he got from them last year? Even with Lester, the Cubs’ rotation still doesn’t inspire that much confidence. Lester 1, Arrieta 2. But after that? phew. They signed Hammel back; its hard to predict how he’ll perform. Travis Wood? 5+ ERA in 2014. Edwin Jackson? 6+ era in 2014. I guess they like what they see in Kyle Hendricks as a #3. And they got Straily from Oakland as a 4-A/6th starter. So Lester, Arrietta, Hendricks, Hammel and Wood/Jackson/Straily right now unless they acquire another arm. I’m guessing they go after one of the 2nd tier arms on the FA market (Shields, Santana, McCarthy) and roll out a pretty formidable team in 2015. Is Lester worth the money? Hell, are any of these guys? That’s the market, and baseball right now is awash with money. While I do think Lester affects JZim’s market, I don’t think it sets the floor for JZim. This is because Lester has been better, longer than JZim. Yes, better. Although you can run comparative stats like ERA and WHIP, they lack context. Remember that Lester doesn’t just pitch in the AL (facing the DH instead of pitchers batting), he pitches in the AL East, having had to regularly face some of the more powerful lineups in the game in some seriously hitting-friendly ballparks. This is one reason why, when measured by fWAR, Lester was better last year (6.1 to 5.2), better over the last four years (17.1 to 15.4) and for his career (35.4 to 17.0) than JZim. Lester is also left handed, isn’t on his second UCL, and has an extensive and successful postseason resume, including pitching in a World Series. Lester also did not cost the Cubs a #1 draft pick, and Jordan Zimmermann still has the risk of injury or poor performance in his final season before free agency. This is no knock on Jordan Zimmermann, it’s an impressive run of achievement for Lester. Zim’s one big advantage over Lester is that he is 28 months younger (16 months younger at the point of free agency). So no, it’s not going to be cheap to sign JZim – it’s likely to take six seasons and an AAV in the $22-24M range. But it shouldn’t require Lester money. I think I agree that Lester’s market is higher than JZ’s (assuming both were FAs right now, but it would be close). But because JZ has another year of control, John C’s numbers may be right – 6/$130 now may get it done(starting after his $16m deal for next year), because it removes the injury risk for JZ. But Rizzo should learn from Cherington’s mishandling of Lester and not try to lowball him any longer. Either pay up or move on. Should we do it? Well, before saying either way, let me add that I do not think it wise for a team to commit this kind of contract to two pitchers, so we would basically be choosing between JZ and Stras long term. You would have to assess whether Stras would even sign, although I guess you could try to negotiate both simultaneously and pick the first one to sign. But I guess I agree with Todd that Stras is unlikely to sign an extension (although except for Scherzer, has any pitcher ever turned down >$140m? ), so I would probably make this offer to JZ. And if he took it, I think I would probably flip Stras now if I could get a package that included 1 stud position player and two high upside guys, but could see the reason for keeping him and maxing out the WS chances. Rizzo just called, and he wants John C. to contact him so he can convince SFX that J-Zimm is worth less than Lester. For while John’s points are well taken, there’s no way J-Zimm’s people are going to accept less than Lester is getting, particularly for a guy who is two years younger. Just what is Lester getting? Apparently a huge bonus ($30M, with $20M up front), which won’t make the year-by-year so onerous. Sounds like an NFL contract, except they can’t cut him after a couple of years. The only way I see that the Nats could play it would be to front-load the contract, include an opt-out, and pray that Zimmermann takes it. So: 20(arb yr)-27-27-27-22-20-20 = 168/7 = 24 AAV (nearly 25 without the arb yr). The opt-out would come after the 4th year, when J-Zimm is 32 and still very marketable, and at the end of the 2018 season, when Harper is about to go on the market. Really, it would be 101/4 with the opt-out. Of course you could play around with the per-year with bonuses, but this would be a market-based bid. Is it worth it???? I don’t know. I really don’t. And Strasburg will be younger, so Boras will be demanding more. More in relation to the original post, the Nats didn’t clear any spots on the 40-man by the Monday deadline, so they won’t be participating in the Rule 5 draft tomorrow. Skole is showing up on the second or third tier of draft lists, and I saw Vettleson as about the 25th player mentioned on one, but I seriously doubt they will be drafted. 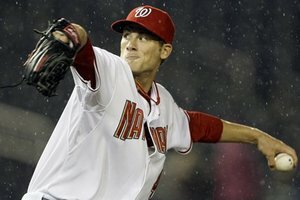 Logic would have the Nats sign Fister before Zimmerman to set the market. That is has not happened, especially since Fister has 1) success that is not dependent on velocity and 2) a better injury history, makes me wonder whether Fister has told them he wants to test free agency. The waving at Desmond, no sincere meeting, tells me the team is seriously thinking about whether they can upgrade the roster AND save payroll going forward (especially since they have real talent in the pitching pipeline). That requires a lot of creative thinking, but Beane has done it before, so why not Rizzo? Agree with John/Wally; I do not think Lester’s contract is a “floor” for Zimmermann. Longer track record of injury free production, lefty, durable, and his repertoire will age well (he gets guys out not with velocity but with location and changing speeds for the most part). Nobody front loads contracts. I mean, i’m sure there’s a few examples out there but rare. J-Zimm: I don’t disagree that Lester might be slightly better, but I stand by the assertion that J-Zimm’s peeps will still want at least a much. Contracts: yeah, I know that no one front-loads them, preferring to kick the can down the road to the point where you have to pay the Padres $30M to take it off your hands. My point with the J-Zimm proposal was to front-load AND have the opt-out, giving him strong encouragement to take it with the diminishing subsequent return. I’ve about come around to the conclusion of others here that the Zimmermann extension isn’t worth it at that price. Neither do I think he would net a return that would get the Nats closer to the WS, so I’m finding myself more in the “ride him out” camp. Trade craziness: “If you can keep your head when all about you are losing theirs . . .” Lots of interesting developments, but nothing that scares me. No real title contender strikes me as having gotten significantly better, no matter what the pundits breathlessly declare. Skole’s still a Nat, so the small gamble worked. And the guys who would have interested me would have been long gone. Curious that both the Rangers and the Cubs took young infielders despite having a supposed glut of them. Perhaps one or both are still in the market with the Nats somehow? Interesting: only name I recognize is Andrew Oliver, Philly’s 2nd pick. I thought i had written about him before but can’t find him. He sued and beat the NCAA who went after his eligibility on flimsy evidence and got them to settle for an alleged $750k. New posted on Detwiler trade: this might be a record for comments on one post; 76.